Here is another cool project using the affordable Raspberry Pi 3 computer board, but you many need a 3D printer and saw. The Raspberry Pi 3 (Model B) is already an extremely small single-board computer sold for $35 and there is an even smaller version, Raspberry Pi Zero, packing lower performance for a cheaper price. But one modder set out to combine the best of both worlds: A single-board computer sporting the same reduced size as the Raspberry Pi Zero but retain the high-performance hardware of the Raspberry Pi 3. For starters, the prototype consists of a protective black case that roughly consumes the same physical footprint as the Raspberry Pi 3, but measures 7mm thick. 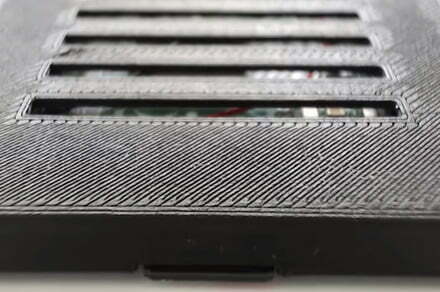 On the top, you will find a grilled vent so heat can vertically dissipate freely from the hardware components inside. The case bottom provides a slot for loading the Micro SD card and three Micro USB ports line up along the front edge. Mounted inside the case is a modified Raspberry Pi 3 board. A comparison with the original shows that the modder removed the four USB ports, the Ethernet port, the strip of 40 pins, the HDMI port, and all the other protruding hardware components. In fact, the whole section of the Raspberry Pi 3 board that previously played host to the USB and Ethernet ports was sawed completely off. With the Raspberry Pi 3 mounted into the super-slim case, the modder filled the empty void with three Micro USB breakout boards that are soldered and wired directly to the main board. The middle Micro USB port serves as the power connection while the two outer ports are for connecting devices. Users can purchase a USB on-the-go (OTG) adapter for connecting peripherals and storage devices to the prototype device. “Depending on what you’re doing it could work well for a general headless system or server application. The small size also means it is more portable, and I could imagine it working well for some kind of wireless access point, pirate box, or a general node of some sort,” the modder states. Called the Raspberry Pi 3 Slim, the prototype is an open-source project that can be accessed on Github here. There, visitors will find two STL files for 3D printing the top and bottom portions of the project’s black case. The Raspberry Pi computer board has served as a highly popular, affordable foundation for countless (and totally awesome) projects since its launch in 2012. These include a programmable Minecraft-themed PC for kids, an unofficial NES Classic console, a miniature Macintosh computer, and even a physical remake of Bethesda’s Pip-Boy seen in the Fallout games. Just recently, Microsoft managed to stuff artificial intelligence onto the board to catch sneaky squirrels stealing flower bulbs and bird seeds.